Olney finally broke their duck on Saturday as they won their first game of the season, beating Oakham 43-20 in emphatic fashion. Having lost their opening three encounters in Midlands 2 East (South), it was shaping to be a long season for the Pinks, but victory sees them climb to eighth in the standings after four games. It was a frantic start to the game, with visitors Oakham in front early courtesy of a penalty. But Olney hit back with an almost immediate response, with Gareth Cahill feeding the backs for Elliot Simpson to score the home side’s first try after just two minutes. Kieran Manson kicked the extras to take the lead at 7-3. From the restart the visitors were penalised in the host’s ‘22’. Olney used the wind and kicked for a line out in Oakham’s ‘22’. Isaac Shields won the ball and Olney’s pack drove for Oakham’s goal line. 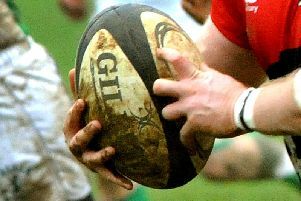 The ball was fed back and scrum half Manson touched down for a try that he converted to stretch the lead to 14-3 after just eight minutes. But back came Oakham, and eight minutes later they had their first try frin Nick Houghton, converted by Calem Krelling for 14-10. A spate of penalties and indecisive lines out kept play in mid field and Lloyd Sweeney, at full back for Olney, broke the pattern fielding a long kick and gaining good ground before joining the backline. Will Edwards on the left wing ran in the try and Manson added the extras to lead was 21-10 after 28 minutes. Oakham gained a lineout in Olney’s ‘22’ from the restart but the home side managed to claim possession and a long kick from Jordan Letts took play into the visitor’s ‘22’. Olney put on pressure from the lineout and drove the ball in the forwards. The Oakham backline were caught offside and Hanson added the penalty conversion to his tally, extending the lead to 24-10 as half time approached. The home side needed kist five second half minutes to restart the scoring, thanks to half time substitute Jake Deighton. With the extras kicked, Olney led 31-5. From the restart Oakham followed up and soon cut the deficit with a try by Charlie McKie converted by Krelling to bring it back to 31-17. Olney kicked off and the visitors ran the ball back, gaining ground into the home ‘22’, a knock on halted their progress. Winning the scrum Olney kicked to touch and Oakham’s throw in was not straight. This gave Olney the advantage at the scrum. A further exchange of penalties resulted in Olney’s Lock forward, Tom Short, being yellow carded. Olney brought back Stanton for Jake Ashton. Oakham converted the penalty and closed the score to 31-20. Oakham were short on subs. and were reduced to 14 men when a forward had to leave the field, injured. This influenced the play and there was no further score before Short returned. Olney were able to exploit their advantage and attacked into the Oakham ‘22’. The forwards gained ground and fed to the backs where Manson broke through the visitor’s defence for an unconverted try taking the score to 36-20 after 30 minutes of the second half. Oakham had to soak up some pressure but their resistance, and their chance of victory fell to a well taken try by Deighton converted with a good kick into the wind by Jordan Letts, wrapping up the win for Olney.